A pale yellow sky is the title of a collaboration between artist jean duncan and musician deirdre mckay the results of which are currently on show in the naughton gallery, at queen’s university. For some years now Jean Duncan has been interested in the concept of creating images inspired by music. In 1994 she produced The Protecting Veil, a series of etchings and projected images based on the music of John Taverner. This was followed by Still Dancers, created in response to Piers Hellawell’s music. Finally, in 2002, came The Fly, which again involved Deirdre McKay and was based on William Blake’s Songs of Innocence and Experience. This time, however, the collaboration of art and music was to be quite different. Inspired by the Japanese haiku – short poetic pieces written to strict rules which dictate, amongst other things, 17 syllables – this was not to be simply a response of either to the other, but rather a complete creation with artist and composer working almost as one, with the words of each haiku focusing their thoughts. The results combine ethereal music, produced by the harp, with refined, sparse imagery, which together create an intense, almost palpable, calmness. There is a very real sense of oneness between the three elements – the words, the images and the music. As Jean says, “both of our media used the same vocabulary – balance, colour, timbre, tone, texture and harmony – while reflecting our separate approaches to the poems”. Jean’s images are mysterious, dreamlike and ambiguous, while the notes of Deirdre’s compositions float in “a sensory, timbral exploration of the natural”. This is more than an exhibition – it is a sensory experience, something to be approached with eyes, ears and every other sense open and responsive. It is something different, something sad, reflective, joyous, emotive and delightful, all at the same time. Whether you like it or hate it , you are unlikely to leave the gallery unmoved. Seacourt Print Workshop Artist Jean Duncan has been selected for a jury award at the prestigious Tokyo International Mini-Print Triennial. Jean received a special jury award for “Ginalollobrigidas”, a print based on the wine growing region of the Douro Valley area of Portugal. She is the only Irish Artist in this exhibition and is the only UK Artist to receive one of 12 jury awards made to Artists from around the world. This year’s 4th Mini-Print Triennial is based at Tama Art University Museum in Tokyo and is exhibiting 1,800 prints from 81 countries of the world. Jean Duncan is a founding member of Seacourt Print Workshop, a Royal Ulster Academy Academician and a graduate of Edinburgh College of Art and the University of Ulster. Her paintings and prints have been widely exhibited nationally and internationally and she is represented in many private and public collections in Ireland and Scotland. LAST week I mentioned the current Jean Duncan exhibition, entitled “The Fly”, in the Old Museum, and this week I went to see it and was certainly not disappointed. 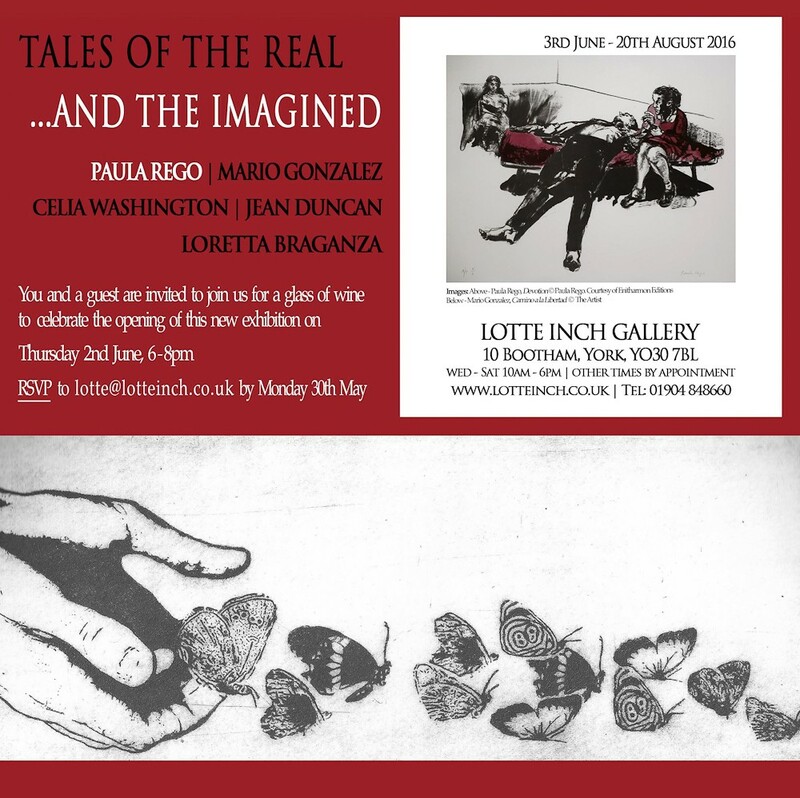 It is an exciting show, full of innovative thought, visual inspiration and a wonderful sense of ‘oneness’ between the poetry “The Fly” by William Blake; the music, composed by talented young composer Deirdre McKay, and Jean Duncan’s visual imagery. The addition of verse in this series is a new dimension in the artist’s exploration of music through painting and print, a fascination which she has had since the mid- 1990s. The painted images dart from thought to thought, all linked by dashing black lines ‘…which echo the trajectory of a fly and the artists imaginative leaps of thought.’ (Amanda Croft in the catalogue introduction). The printed images are bouncing lines which jump along unpredict- ably over Blake’s verse, written in a well controlled hand. This concert on Sunday had a strongly visual aspect, for not only was Piers Halliwell’s piece accompanied by the projection of images on a screen, but the players were bathed in autumnal light, the listeners left in the shade. The composer introduced the work, explained its title and how it had inspired Jean Duncan of the Royal Ulster Academy to produce a number of paintings and etchings. These images were arranged in sequence and matched to the music with hypnotic effect. 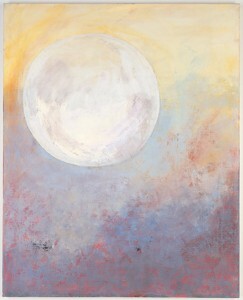 They were not illustrative or narrative, but provided a parallel vision of abstract forms and visions. Scottish-born Jean Duncan’s In Stillness and Heat at the Guinness Gallery in Foxrock tackles landscape at another extreme. 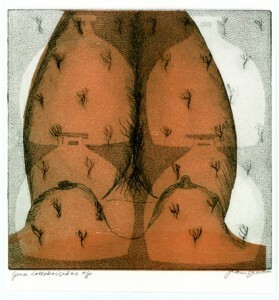 Her show is a kind of painter-printmaker’s diary of a visit to a village in Andalusia. This isn’t to say that it is an anecdotal account of her stay. Rather she uses the physical fabric and the atmosphere of the village as a theme on which to base a number of relaxed variations, from small, relatively naturalistic scenes to grid-like abstractions, via stylised vignettes. She is particularly good at capturing the sun-baked textures of the buildings and intensities of light and shade. BOTH these printmakers are Northern artists, and both are involved in the Seacourt Print Workshop in Bangor. Their styles and approaches, however, are very different, and each has been allotted a floor of the Graphic Studio Gallery to prove this. Their personalities, however, complement each other rather than clash head on. Jean Duncan, on the ground floor, bears at times a surprising resemblance stylistically to the late and lamented Mary Farl Powers. She employs a kind of “ribbon” motif and has a strong calligraphic bias, elegant and flowing, but also, by contrast, sharp and angular at times. The colour is always clean and tasteful, and as you might expect, there is a polished, almost a virtuoso technique. 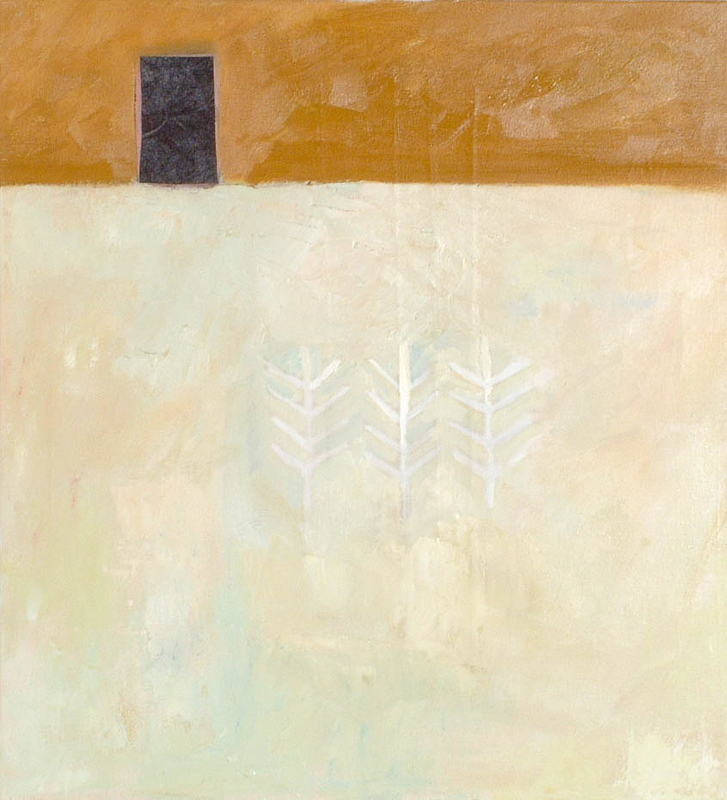 On the floor above, Margaret Arthur appears much less involved in the actual concerns of “quality” printmaking and more in reaching out into an extra, imaginative dimension. In fact, she is almost an Expressionist, and the titles indicate a strong literary interest but the prints themselves are not literary or illustrative. They have a strong landscape element and also employ figures in a dramatic or visionary way, almost to the point of surrealism in certain cases. It would be particularly interesting to see her work with or alongside a literary text, creating her own visual equivalent or parallel to it.